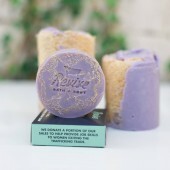 Betty works for Creative Soap Week and was kind enough to give us a little shout out on her site! Thanks Betty! 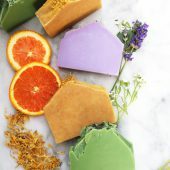 We’re honored to be recognized with other fantastic soaper’s like Soapylove and Sunbasilgarden Soaps and A Breath of French Air! 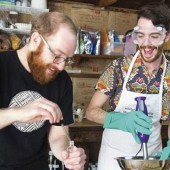 Want to learn how to make the featured soap? 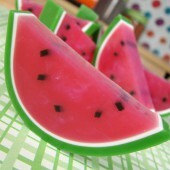 Check out the Watermelon tutorial HERE and the Soapy Rocks HERE! 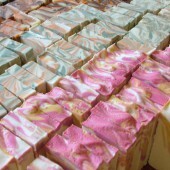 You can follow Creative Soap Week on Facebook and Twitter. Oh The Things You Can Do! Soap Frosting 3 More Ways. 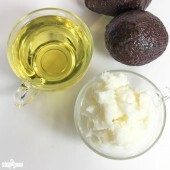 When I decided to try my hand at a simple soap frosting recipe, I had no idea what it would become! 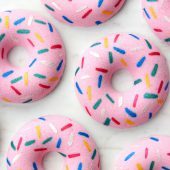 Frosting was just the tip of the iceberg. 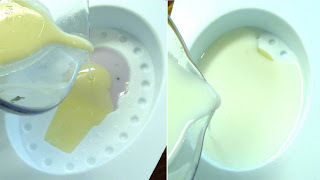 Here are several things you can do with the same basic formula which is 4 oz of melted soap base + 2 Tablespoons of liquid soap, whipped with a hand mixer (click here for a great Soap Queen video). 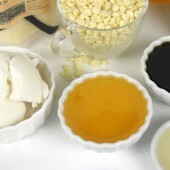 Add colorant and fragrance as desired. 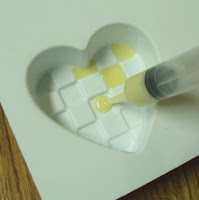 Note: The Soapylove products suggested in this tutorial have been discontinued. 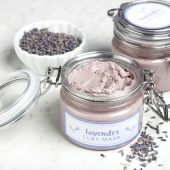 The links have been replaced with similar ingredients from BrambleBerry.com. 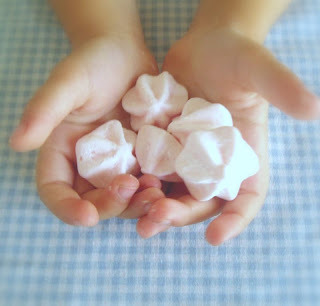 Soap Meringues (shown above): Whip frosting recipe until shiny peaks form. 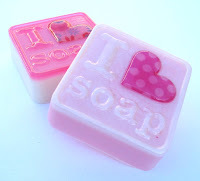 I used red colorant and Strawberry Fragrance Oil. Quickly put mixture into a piping bag (I used my bag and star tip). Squeeze out 1″ meringues onto tin foil, waxed paper, or parchment. Allow to dry. Peel paper away from backs of meringues and toss lightly in cornstarch. 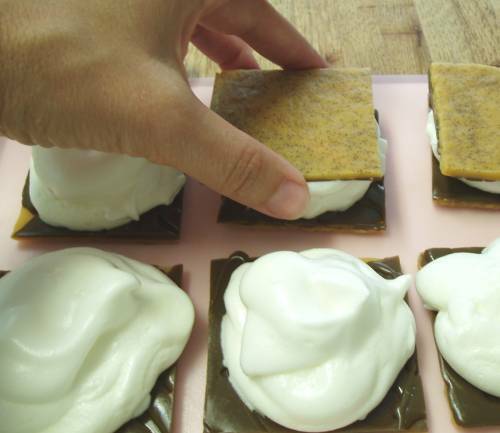 Soap Marshmallows: Follow instructions for Soap Meringues, but this time pour into a brownie pan lined with plastic wrap. 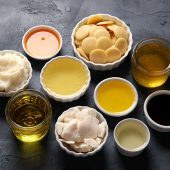 Allow to dry and harden, then remove plastic wrap and cut into blocks with a sharp knife. 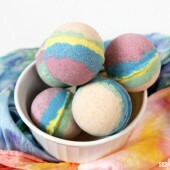 Toss lightly in cornstarch. This style is great with jojoba beads. 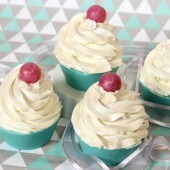 Fluffy Fillings: The original way to use this recipe was to spoon it on. 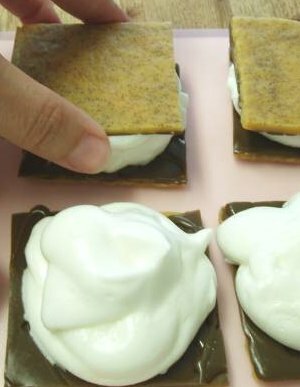 Depending on how long you whip it you can get a creamy icing or a firmer marshmallow fluff, like for these S’Mores featured in the Summer ’10 issue of Let’s Get Soapy, or the Hot Chocolate Loaf Soaps in the Winter ’09 issue. 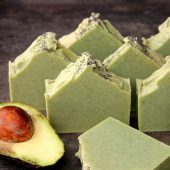 Over at the Soapylove Fan Page, Tammy of Milk and Cookeez generously shared photos of her projects plus we had a great discussion about how to use this sometimes-tricky recipe. Here are a few more pictures from her album! 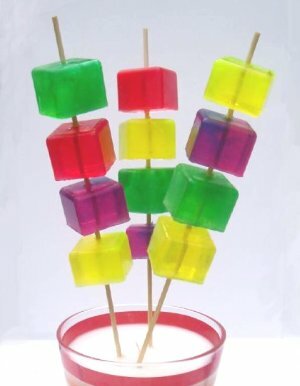 So I encourage you to try this recipe and play around. It can take some practice to control it well, but I guarantee you’ll have fun! 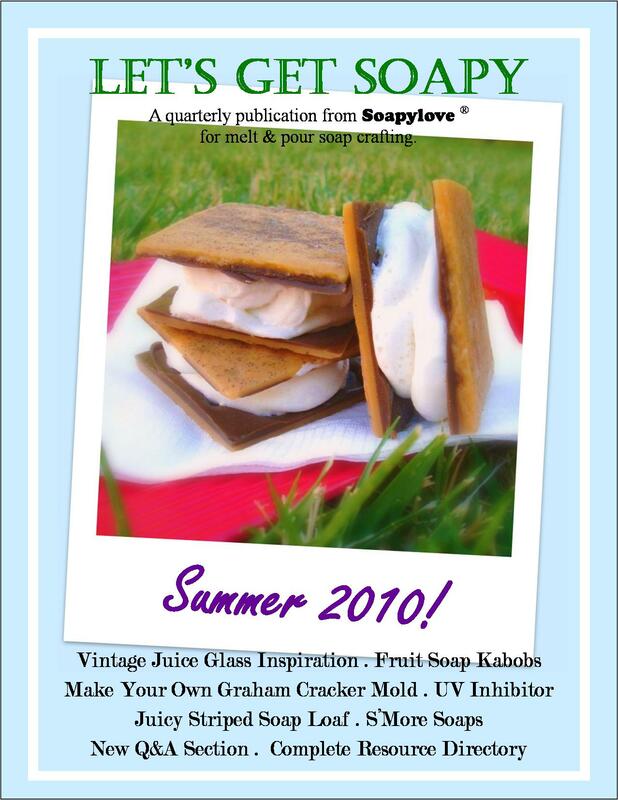 The new Soapylove eZine hits stands today (well…you can download it today)! 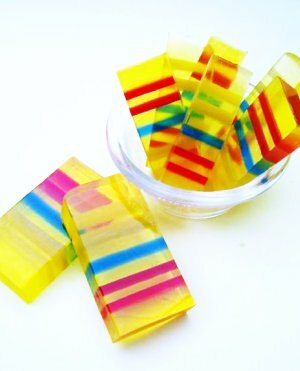 Get your issue of Let’s Get Soapy, Summer 2010 and learn how to make these happy and campy soaps from a glycerin soap pro, Soapylove! Here’s a sneak peek of some of the projects (shhh…don’t tell). Hi everybody! You may have recently seen Anne-Marie’s post about my Bicycle Soap which I made just for the Soaper’s Showcase at the HSMG Conference in Denver earlier this month. I wanted to use as many techniques as I could to wow the crowd, and I’m thrilled to say it did win for Best M&P Appearance (thank you, Conference attendees for your votes!! ), and now I will show you how I did it. 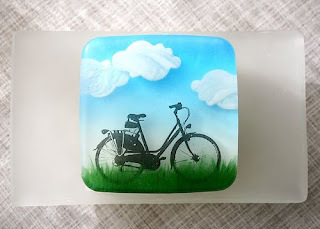 First I printed out a bicycle graphic on soap embed paper using a laser printer. I neatly cut it out, leaving about 1/16″ of white space all around. 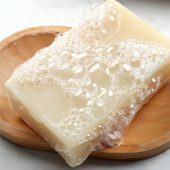 It doesn’t have to be perfect since the white paper becomes translucent in the soap. 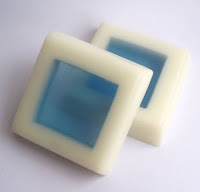 I poured 1/8″ layer of clear soap base into a basic square mold. With a small, flat paintbrush, I mixed green chrome oxide with a drop of liquid glycerin. 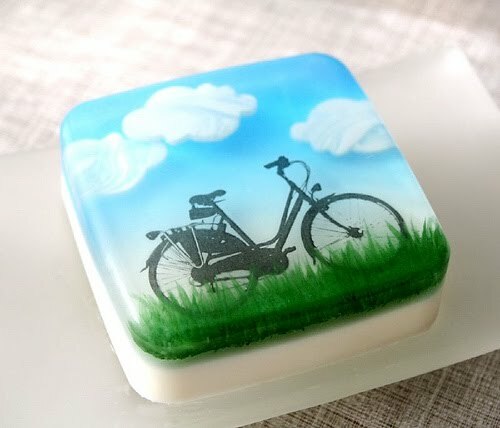 I painted wispy grass on the hardened layer of clear soap. I let it dry completely. At last, we’re ready to make the sky. 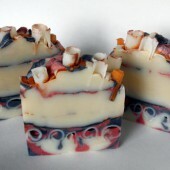 I mixed blue non-bleeding colorant with pearl mica and stirred it into clear soap base. I poured 1/8″ layer into the mold, then propped one side onto a notepad to make the sky only cover 1/2 of the mold. 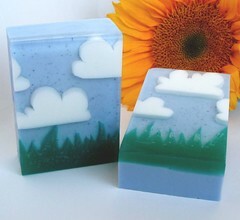 Finally I topped it off with white scented soap on a level surface. Voila! This is certainly an “art piece” and not one that I would make to sell. I made another to give to a celebrity designer that I might meet this week which will probably be my last one. But I’m thinking about some variations – this diorama idea has so many possibilities! Can you tell I’m addicted to glycerin soap? I love it!! 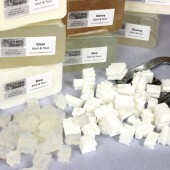 Another BIG congratulations to Debbie Chialtas, a.k.a Soapylove, for winning the Best Melt and Pour Soap at the Handcrafted Soapmaker’s Guild! Even though I’m not entirely shocked that she won (I know how talented she is), I was still blown away by her entry. 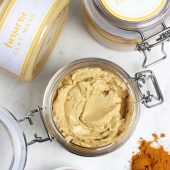 It’s unique, fresh and inspiring! 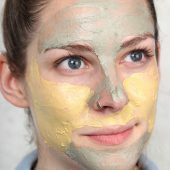 Debbie Chialtas is also a guest blogger for the Soap Queen Blog. 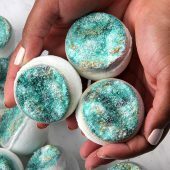 Check out some of her creative projects she’s designed exclusively for the Soap Queen Blog and don’t miss out on the Soapylove Product Line at Bramble Berry! Soapylove Tutorial: 2 Scoops, Please! 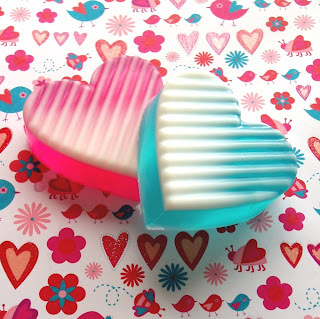 Anne-Marie and I are so excited to release the newest design in the Soapylove supply line – the Ice Cream Cone Mold! With polka dots, layered ice cream scoops, and an adorable “cake” cone, you will have so much fun designing your own flavor combinations. Here’s a quick tutorial to get you started! 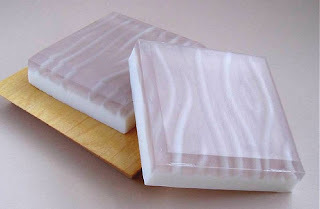 Melt 1 oz of white soap base. 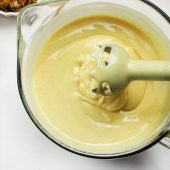 Stir in several drops of Bakery Beige color until you get a nice milk chocolate color. 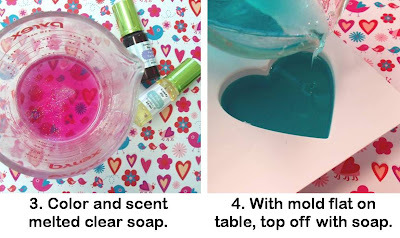 Spray mold with rubbing alcohol, then pour soap into top “scoop” area. 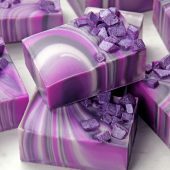 I found that if I poured the soap close to the rippled edge then filled in the rest, that I would get the best coverage without overflow. Allow to harden. 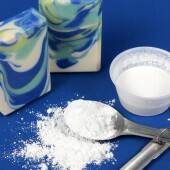 Next melt 1 oz of white soap base. 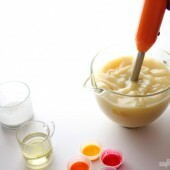 Stir in a few drops of Pink Frosting color, then a tiny sprinkle of poppy seeds (you can also use the Rainbow Sprinkles! Very cute!). 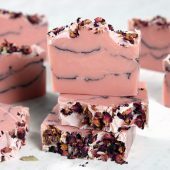 Spray the chocolate soap and the mold with alcohol, then pour in pink soap filling the second scoop area and covering the chocolate scoop. Allow to harden. 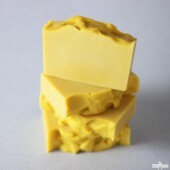 If you do have overflow, wait until soap is hard then cut excess away with a sharp knife. 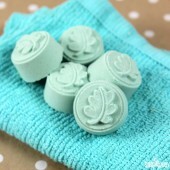 Melt 1 oz of white soap base and color with Buttercream colorant. 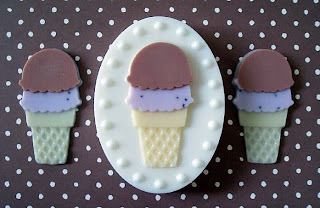 Spray mold with alcohol, pour soap into cone area and cover both scoops of ice cream. Allow to harden. 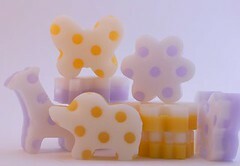 * If you want incredibly cute guest soaps or embeds, you can stop here. 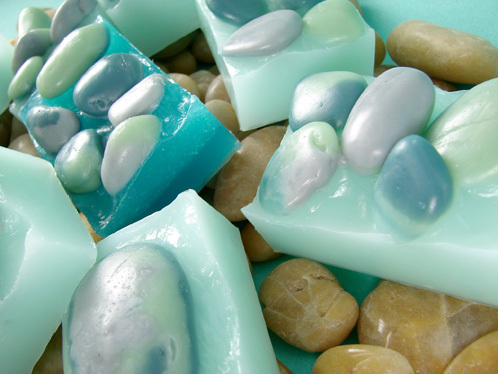 Let the soaps sit in the mold until completely cool then flex mold to release an edge. 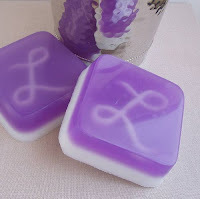 Pull soap out of the mold. 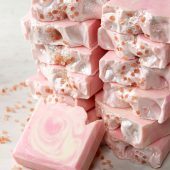 For a complete soap bar, melt 4 oz of white soap base and add any fragrance you like from the Desserts F.O. set. 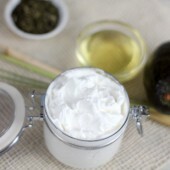 Use equal portions of fragrance and vanilla stabilizer. Stir well and allow to cool to 120 degrees. 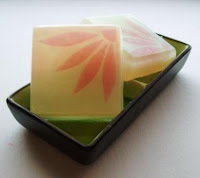 Spray set soap with alcohol, then fill mold. 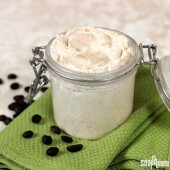 Allow to harden completely either overnight or put in freezer for 10 minutes, and unmold! You can’t go wrong with this mold. 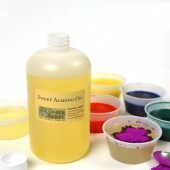 As long as you use non-bleeding colorants, you can do anything! 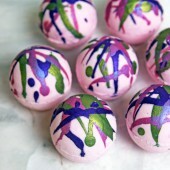 Try using non-bleeding micas for a “sorbet” look, or try marbling 2 colors for a rainbow sherbet effect. I can’t wait to see what you come up with! 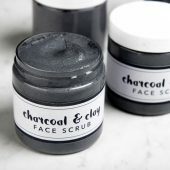 1) Use non-bleeding micas, just a pinch at a time to get a light tinted shimmer that still has clarity. 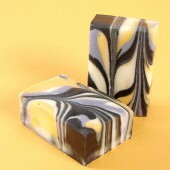 In the Woodgrain Soap above, I used just a hint of cappuccino mica. The engraved design still shows up beautifully and the mica doesn’t bleed (you can find the full tutorial here). 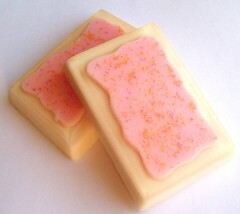 In the Daisy Bars on the right, I used a touch of opalescent mica as the background color. It’s still pearly without looking too heavy. 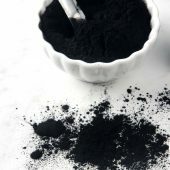 2) Use oxides and pigments with a very light hand. 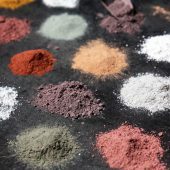 It’s best to start with liquid colorants since it’s easier to add the color one drop at a time, but you can also dilute your powders and add by drops, too. You can see in these Ice Bars that I was able to get a clear blue center that won’t bleed into the white frame. 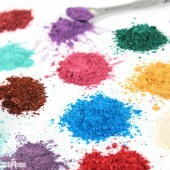 Ultramarines (the blue, purple, and some pink pigments) are very fine powders that keep their clarity very well if used lightly. 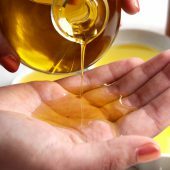 But remember – one drop at a time! 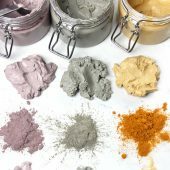 For a quick reference of which micas and pigments Bramble Berry carries that are non-bleeding, check out Anne-Marie’s recent post here. 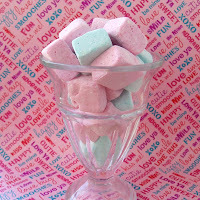 And for some more great projects using sheer colors, pick up your Soapylove book here! Happy coloring! 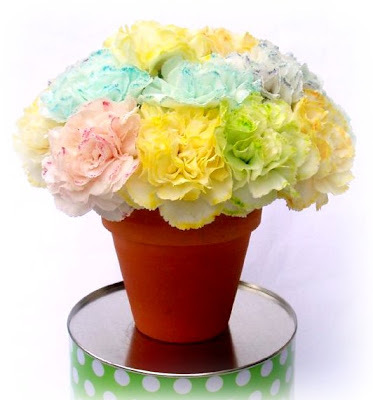 The weather outside might be cold and unfriendly but these Rainbow Carnations will warm up any room! Plus they’re a great project when you’re stuck inside. 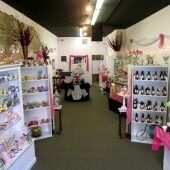 All you need are a bunch of fresh white carnations (baby or full size are fine) and your set of Jewelry Box Colorants. Now let’s get started! First, get 2 cups of warm tap water and 5 or 6 glasses. 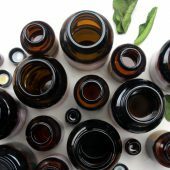 Fill each glass about 1/2″ full then put 3-4 droppers full of colorant in each (use each color individually, plus mix them to get other shades. Check out this handy color mixing chart here). Pour remaining water into a bowl, then cut your carnation stems about 6″ long, at an angle, under the water. Immediately put your cut flowers in each cup. Depending on how fresh your flowers are and how intense your color mixture is, you may start to see color in as little as one hour and get full color saturation in 24 hours. To arrange your flowers in a pot like in the photo, take a small pot, a plastic cup, and a block of oasis. Cut your cup down so the top is below the rim of the pot. Then cut your oasis with a knife until it’s slightly bigger than the bottom of your cup. You should push it down so it’s wedged into the cup. Now start sticking your flower stems into the foam, working from the outside edge into the center. Then fill your cup with water. Ta da!! SHORTCUT! 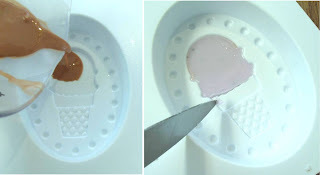 : If you are feeling impatient and want to see some seriously instant results, cut your flower just below the bud (under warm water!) 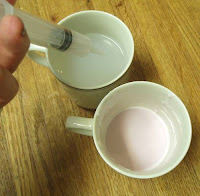 and put in a tiny cup like a shot glass with warm heavily colored water. I started seeing color in 5 minutes!! Have fun! 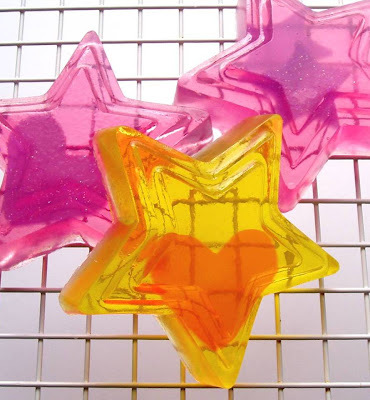 The way you make the Lucky Star Soap is to pour a layer of the main color, let it set, then place an embed on the hardened layer and top off the mold. This way, the embed is floating inside the star. 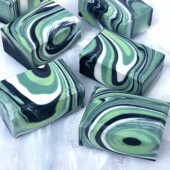 The first time I made the soaps I put the embed directly on the hardened layer, then poured soap on top of it. Unfortunately, the heated soap didn’t get all the way underneath the embed, creating an air pocket. That is why there is that silvery air bubble, which is really distracting. It’s easy to avoid this. 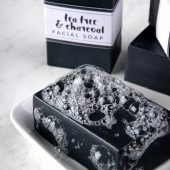 Anytime you are placing an embed into your design, pour some heated soap in first, then place your embed into the soap, and continue to fill your mold. 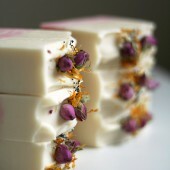 This way, the embed is completely encased in soap with no chance for air pockets. 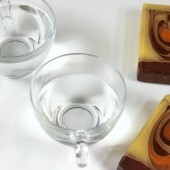 Another way to guarantee a seamless look is to spray your embed with alcohol before placing into the melted soap. 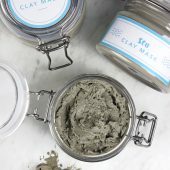 I have included photos of other embedded projects which use this technique. 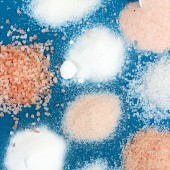 They can all be found in the “Soapylove – Squeaky Clean Projects” book. Have fun! 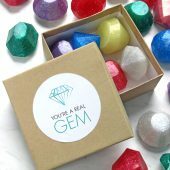 If you love bright colors and plastic jewelry (or did when you were a kid, like me! 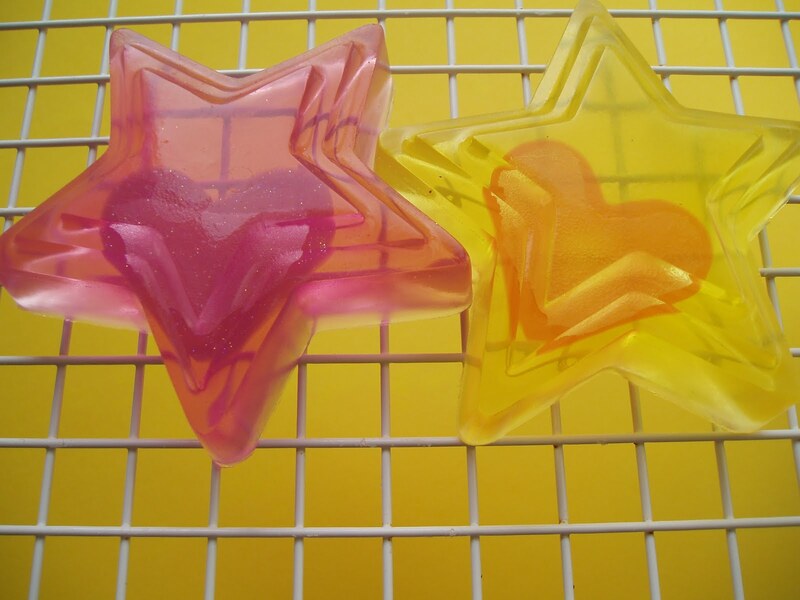 ), then this soap project is for you!A sweet little heart is floating inside the new Soapylove stacked star.It’s simple and fun, and I bet Martha Quinn* would love them! Makes 4 stars, instructions are for the yellow style. 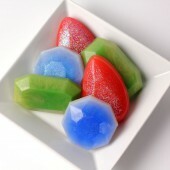 Melt 3 oz of clear soap, color darkly with liquid red colorant. 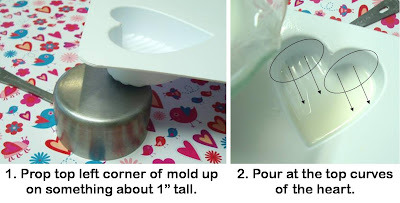 Pour into plastic storage container (or into the lid, like I did), to 1/8″-1/4″ thickness. Allow to harden and unmold. 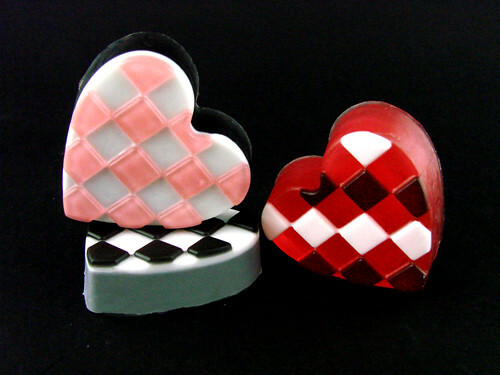 Cut red soap sheet with heart cutter. TIP: to prevent your cutter from splitting at the seam, wrap the seam in tape before using. 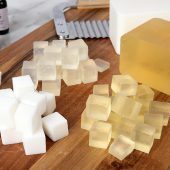 Melt 12 oz of clear soap and stir in a few drops of Sunshine Yellow colorant and Cherry Pop fragrance oil. 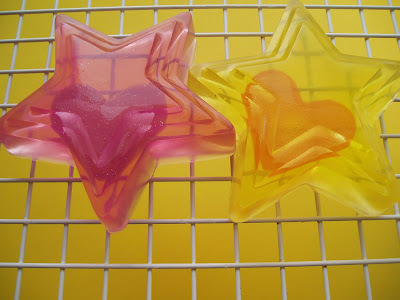 Fill mold to second star, spray with alcohol to pop any bubbles, and allow to harden. 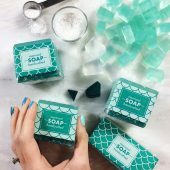 Remelt remaining soap if a skin has formed but make sure it’s not above 120 degrees (or too hot to touch with your bare fingertip). 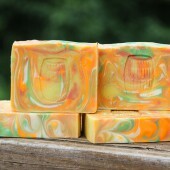 Spray hardened yellow soap with alcohol, then pour a thin layer of soap into the mold. 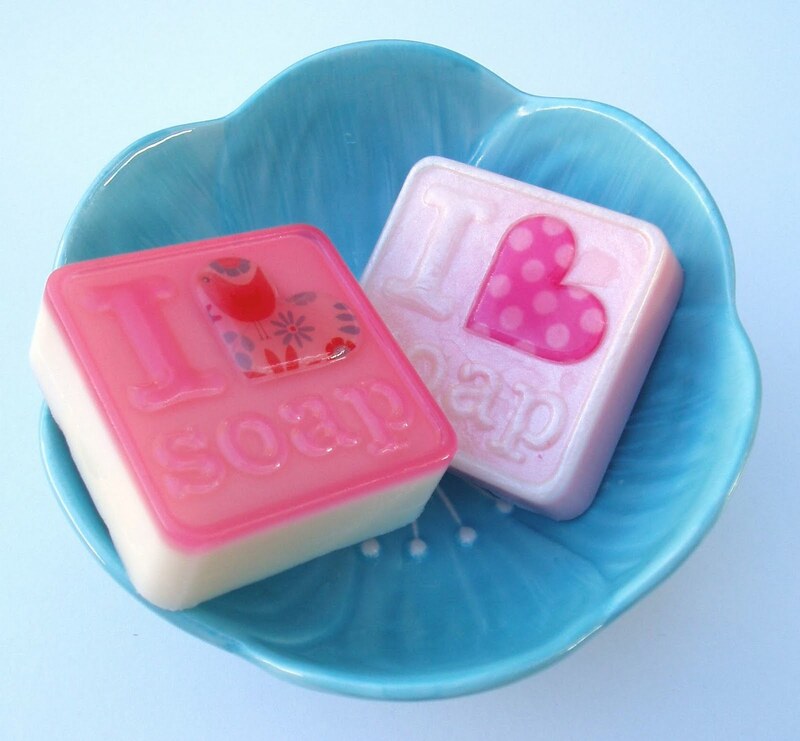 Quickly spray a red heart with alcohol and put into the hot soap. Spray again with alcohol and top off mold. 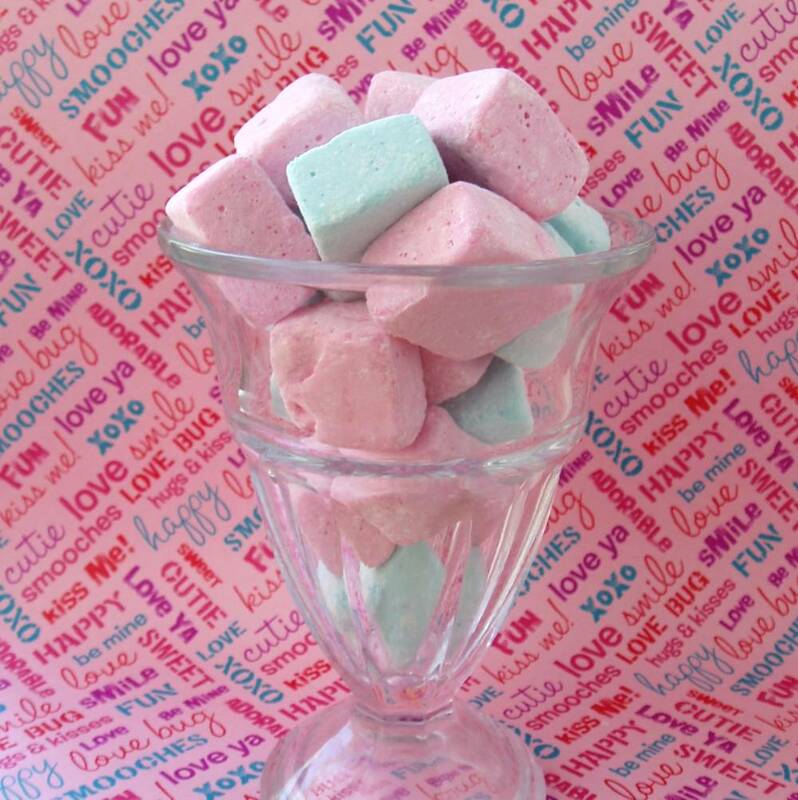 Repeat for remaining cavities. Allow to harden overnight at room temperature. 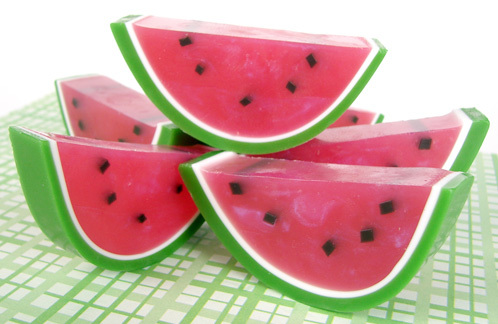 Pull away sides of mold to create an air pocket, then invert and push on back until soap pops out. 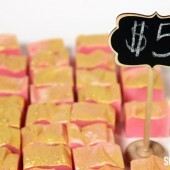 For pink and purple variation, I used Sparkle Dust from the Jewelry Box Colorant Setand non-bleeding purple colorant for the hearts and stars, then Fiery Fuchsia colorant with Pink Strawberry Fragrance Oil for the soap bar. 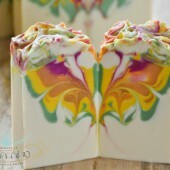 You can create another layer of soap plus an embed to add more dimension to your design, too! 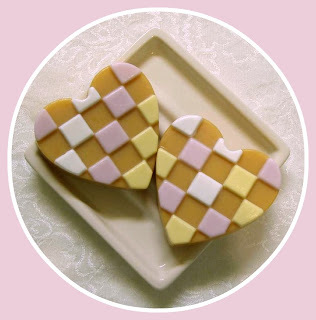 I am totally loving the versatility of this swell Checkered Heart mold – the latest addition to the SoapyLove line. 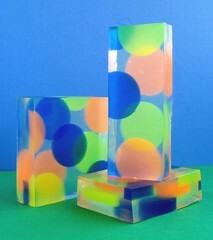 We’ve done this mold in all kinds of color combinations and love how each and every color combo looks. 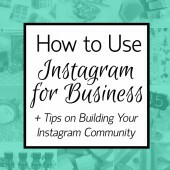 Kudos to Debbie for coming up with such a user-friendly design. 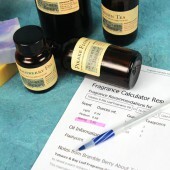 In other Bramble Berry news, we’ve halved the price of our Patchouli Essential Oil. 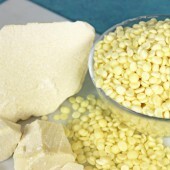 Our latest crop smells incredible and the market price on this commodity has dropped significantly to $44.50 per pound.